Winning the information war redux - CEPA STRATCOM PROGRAM. 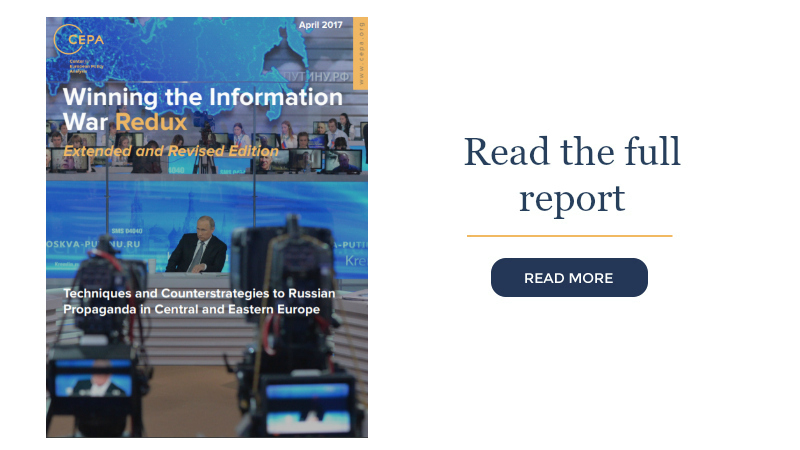 In the original report by the Center for European Policy Analysis (CEPA), “Winning the Information War,” the authors wrote that Russian information warfare posed a serious threat to the United States and its European allies, “primarily the ‘frontline states’—Poland, the Baltic states, the Czech Republic, Slovakia and Ukraine.” Since then, the picture has changed. The use of “hacking and leaking” and other propaganda techniques in Western elections have intensified fears of similar interventions in upcoming votes. This makes Western democracies a new frontline in the information war. It now runs not along the eastern frontier of the Euro-Atlantic region, but through its heart—in Berlin, London, Paris and Washington, D.C.